There few upper extremity conditions that are more devastating injury to his nervous system. The present work stands for a reconstructive surgeon, that the fundamentals for the knowledge of this system, and has a plastic base, orthopedic or neurosurgical start with an understanding of anatomy and how to approach surgically neural structures at any point of the limb superior. This premise, “it all starts with the anatomy”, is reflected in the careful selection, carrying delicate photography and superb anatomical specimens cryopreserved. examines the anatomic from experiences and questions raised in hospital visits and surgeries. Clinical systematically covering anatomoquirúrgicas characteristics of brachial plexus and peripheral nerves of the upper extremity. general, motor points and intraneural anatomic features. clinical examination with aspects motor, sensory and vegetative corresponding, both in normal and in pathological situations with images of the most characteristic clinical signs. Each chapter has added a section on surgical approaches to expose the different neural elements and how to access each region. includes a website that provides access to a collection of real clinical cases provided by surgeons with experience in the field, as well as videos that dynamically displays the approaches of brachial plexus and peripheral nerves of the limb higher. 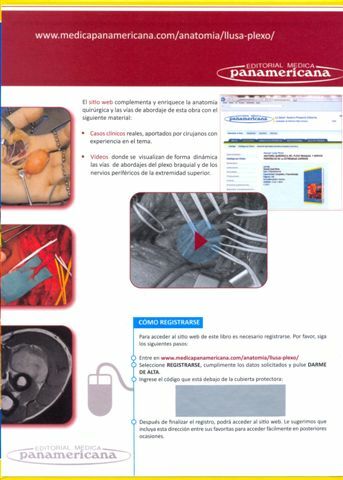 This book aims to bring the most relevant surgical anatomy of the brachial plexus and peripheral nerves of the upper extremity to people who may not always have direct access to a dissecting room, as students, resident doctors of this specialty and healthcare professionals with an affinity the subject and interest in this area of ​​the musculoskeletal system. Also, the authors present their extensive personal experience in daily clínicoquirúrgica practice in the evaluation and diagnosis of the disease that affects the brachial plexus and peripheral nerves of the upper extremity. Manuel Llusá Pérez Professor of the Department of Anatomy and Embryology. Faculty of Medicine, University of Barcelona. Macro-Microdissection Laboratory and Surgical Anatomy. Hospital Vall d’Hebron, Barcelona, ​​Spain.